Equatorial Guinea is a small country in Central Africa, divided into two parts, the mainland and the islands. 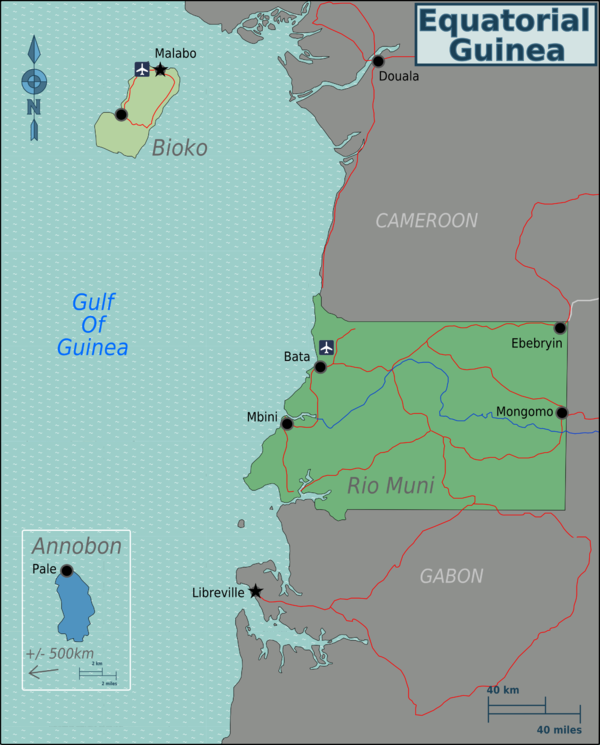 A former Spanish colony, it borders Cameroon and Gabon. This country is one of the largest oil producing countries in Sub-Sahara, behind Angola and Nigeria. Since the discovery, the country has flown into economic stardom, but this country remains one of the most corrupt countries in the world, and it is very common to see officials asking for bribes around the corners of the country. The locals are very hospitable and have a certain affection for almost everything related to Spain. Until 1968, the country was a Spanish colony, making it the only country in Africa that was colonised by Spain. In the Rio Muni region there is believed to have been a widespread pygmy population, of whom only isolated pockets remain in the north. Bantu migrations between the 17th and 19th centuries brought the coastal tribes and later the Fang. The Portuguese explorer Fernão do Pó, seeking a path to India, is credited as being the first European to discover the island of Bioko in 1472. He called it Formosa ("Beautiful"), but it quickly took on the name of its European discoverer. The islands of Fernando Pó and Annobón were colonized by Portugal in 1474. In 1778, the island, adjacent islets, and commercial rights to the mainland between the Niger River and Ogoue Rivers were ceded to the Spanish Empire in exchange for territory in the American continent. From 1827 to 1843, the United Kingdom established a base on the island to combat the slave trade which was then moved to Sierra Leone upon agreement with Spain in 1843. In 1844, on restoration of Spanish sovereignty, it became known as the Territorios Españoles del Golfo de Guinea Ecuatorial. The mainland portion, Rio Muni, became a protectorate in 1885 and a colony in 1900. Between 1926 and 1959 all three regions were united as the colony of Spanish Guinea. Equatorial Guinea gained independence from Franco's Spain in October 1968. Since then, it has been ruled by two men. Francisco Macías Nguema, the first president, was a brutal dictator who despised intellectuals, killed a large number of the ethnic Bubi minority, banned fishing, and awarded himself a huge number of grandiose titles (including President for Life). After a purge on his own family, he was overthrown by his nephew Teodoro Obiang Nguema Mbasogo in 1979 and later captured and executed by shooting. Obiang's rule has seen less violence, but his regime is still brutally repressive. Political power is centralized in his small mainland clan, and most senior members of the government are related. The discovery of large offshore oil reserves in 1996 has brought a considerable amount of money into the country, giving it one of the highest GDPs in Africa, yet much of the money goes into the hands of the ruling elite, with the majority of the people remaining very poor. Equatorial Guinea has two distinctive and very pronounced seasons: rainy and dry seasons. April to October are the wettest months of the year, and December to March are the driest. The major ethnic groups are the Fang of the mainland and the Bubi of Bioko Island. Equatorial Guinea recognizes the major Christian holidays. October 12 is Independence Day. Entry will be refused to citizens of the Guinea, Liberia, Nigeria and Sierra Leone, and those who recently visited those countries due to the current ebola virus outbreak. Citizens of Cameroon, the Central African Republic, Chad, the Republic of the Congo and Gabon may enter Equatorial Guinea visa-free, provided that they have a national identity card or biometric passport. All other nationalities need to submit to an EG embassy all of the above (plus passport and letter of invitation which is only granted from a Equatorial Guinea resident and almost impossible to get) in order to receive a visa. In Washington, the fee for the visa is USD100. There are two paved airports, one a few miles from Malabo (SSG), and one in Bata (BSG). The country's main airline is Ecuato Guineana de Aviación, which operates national and international flights out of Malabo International Airport. Other airlines flying to Malabo airport include Lufthansa (from Frankfurt via Lagos), Iberia (from Madrid), JetAir (from Gatwick airport in London), Air France (from Paris), Ethiopian Airlines as well as Turkish Airlines. The capital is on an island. However, the mainland may be accessed from Gabon via paved(tarmac) roads and from Cameroon via dirt tracks (inaccessible in rainy season). Roads in EG, however, are in a very dilapidated state(even for W. Africa) and 4x4 is necessary many months of the year. Note that the entry from Campo can be often closed. Also, the entry from Kye-Ossi and Ebebiyin may deny entry for visa-free Americans if sufficient reason for entry is not presented or if one is not ethnically Caucasian. The official languages are Spanish, French and Portuguese. Spanish is the language of education and administration, and is spoken fluently by roughly 68% of of the population, it is national language. 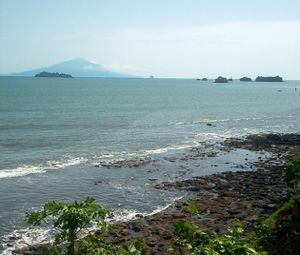 On the island of Annobón, Fa d’Ambô (a Portuguese creole), replaces Spanish as the main language. The language is widely spoken in Malabo and among some people on Equatorial Guinea's mainland. Many residents of Bioko can also speak the local trade language Pichinglis, an English-based creole. Despite the fact that French and standard Portuguese are official languages, they are not widely used. If you can only afford one phrasebook, bring a Spanish one. The country also has a large number of indigenous languages, including Fang, Bube, Benga, Ndowe, Balengue, Bujeba, Bissio, Gumu and the nearly extinct Baseke. Most African ethnic groups speak Bantu languages. Although there is an Anglophone ethnic group in Bioko, standard English is spoken by few people, even in the capital city. There are lots of beaches so that would be a good thing to take in mind when considering sight-seeing. It would be advised to take precautions listed in the 'Stay Safe' category. There is NO tourist support in Equatorial Guinea. To leave the immediate Malabo area you will need to find a reference from hotel staff. Prices for a ‘tour’ of the island are shocking ($400/day), but keep talking until you get to $150. Equipment can be a clapped out van. To visit the two actually interesting parts of the island you have to go to the Ministry of Tourism and submit a detailed letter of request, then wait a minimum of 2 days for permission to be granted. [Opinion]. There is actually nothing to see that is notably beautiful. Everything is extremely expensive in Equatorial Guinea. A decent room with very limited amenities (bring all the necessary stuff like towel, soap, shampoo, etc as the hotel may not have any) will be at the range of USD75 to USD300. A simple lunch will cost at least USD20 (without drinks like wine, beer or soft drinks) in a clean and air-conditioned restaurant. There are several good places to go to eat particularly in Malabo. The coffee shop at Hotel Sofitel (located just across the Cathedral along the north coast) offers French cuisine. Hotel Bahia's main restaurant is also a favourite destination for both local and expats. If you like pizza and pasta, the Pizza Place is the best place in town. For Asian cuisine, Restaurante Bantu offers authentic Chinese cuisine. For Morrocan and other European food, try La Luna. Try An Equatorial Guinean cuisine such smoked beef with a black pepper. There is also a roast duck with cheese and onion leaf. Ebebiyin is known for its large number of bars. They drink a lot of wine. Due to the influx of foreign workers and foreign investment in Malabo as well as in the continent, there is an ample choice of hotels. There are very few tourists. Nearly everyone who travels to EG is on an expense account, so hotel prices reflect this. Don't photograph airports, government buildings, or anything of military or strategic value. Local folks including children are generally averse to foreigners taking their picture. As a general rule, it is not advisable to bring a camera while walking around town as this can cause real trouble with the police. Avoid any and all conversation related to politics. Criticizing the government, and especially the president, will lead you into trouble. Your local contacts will most likely suffer an even worse fate. If you feel that you are being dragged into a political conversation, or if you are asked for your opinion regarding local politics, stay neutral and don't offer your opinions. Equatorial Guinea has tropical weather and is normally very hot. It is best to wear lightweight clothing. Avoid wearing dark colours due to mosquito concerns. Equatorial Guinea despite being a country with enough resources and is the country with the highest economic growth in Africa, does not provide any legal certainty for European, American or Asian working within the country. You must visit with a guide and need special permits in some locations. Consult to the website of the Ministry of Foreign Affairs where information using extended over the areas of risks. An organized tour is recommended to avoid unpleasant situations with military checkpoints on the roads especially in the island of Bioko, where the presence of Westerners is obvious and therefore the risk is particularly evident. Equatorial Guinea is, overall, a safe place to visit, especially in Malabo and Bata. Food/Water: There are no drinkable or clean water sources in Equatorial Guinea. Travellers should drink only bottled water. Take care when consuming any fruits or vegetables that may have been washed or drinks that may contain ice cubes or 'water' additives such as coffee, tea, lemonade, etc. Wear Shoes: Beaches in Malabo and Bata are beautiful however, due to discarded trash and unsafe sand bugs it is a good idea to always wear shoes. This applies to walking on carpeted areas as well. Malaria Medicine: Malaria is a leading cause of death in this country. It is advised that visitors consult their doctor for malaria tablets. This page was last edited on 19 April 2019, at 20:22.